Create a Fire-Resistant Landscape | Schulhoff Tree & Lawn Care, Inc. 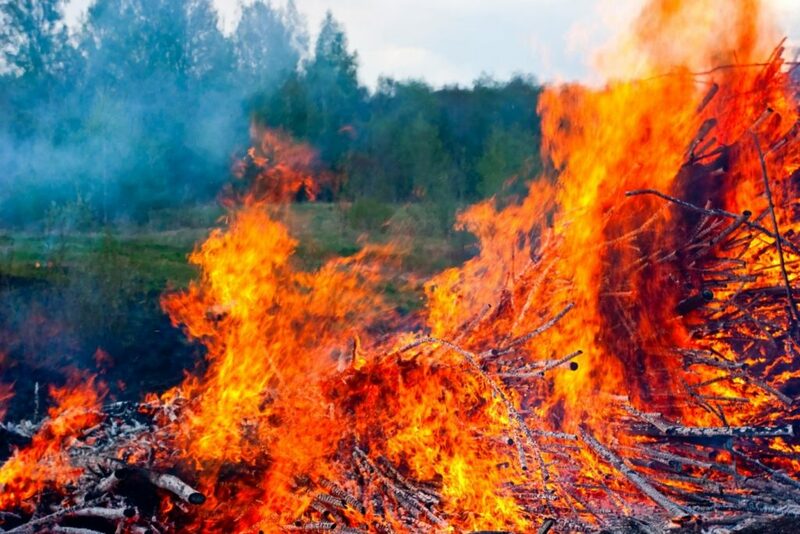 If you live in an area where wildfires are a constant threat, you can take steps to improve the overall chances for your property. Keep in mind that you may have to revise your ideas about how you want your landscape to look. That being said, here are four ways to make your landscape more fire-resistant. If you want a sprawling-English-manor look, the grass will burn all around you if fire rages through. Remember that the ancient prairies burned for miles on a routine basis. They were rejuvenated by the process. You also need to understand that even the native grasses in Colorado are not fire-resistant. No grasses can be considered such. If you want to have grass in a fire-prone area, keep the edges away from directly contacting your structures. Keep all grass lawn areas small and easy to manage. Wildfire-prevention experts stress the wisdom in spacing plants and other materials to create what’s called a “defensible space.” Inspect your landscaping to determine your property’s ignition zones. These are vulnerable areas vegetation or other materials can cause fire to spread easily. Start at your home and work outward to 30 feet. There should be at least a five-foot barrier of fire resistant plants or other materials around the foundation of your structures. Use rock or nonflammable mulch if you don’t want to maintain shrubbery or perennials. If shrubs are spaced too close to a window or door, any ignited shrubs may cause windows to break or doors to burn. This creates an entry point for your home. Space shrubs at least five feet from the foundation of your home. Other plants within the 30-foot zone should be spaced far enough apart to be unlikely to catch neighboring plants on fire. A phenomenon called horizontal fuel continuity means adjacent, low-lying plants may spread fire to each other at high wind speeds. For wildfire to spread when shrubs are spaced farther apart, the wind velocity must be higher than when plants are touching or close together. Trees within this defensible zone should be trimmed so that lower branches and all dead wood is cut away. This eliminates the vertical fuel continuity of the tree. The top of the tree is less likely to catch fire if there is no fuel to light it further down the trunk. If you have grass lawn growing, water it regularly and rake away leaves conscientiously. Check your shrubbery for trapped dead leaves, branches and other debris. Keep the ground around all of your shrubs free of pine needles and leaves throughout the year. Herb and flower beds should also be maintained. Dead foliage and plants should be removed or cut away from bulbs or corms that stay in the ground over winter. If plants get leggy and begin to creep too close to other plants, an ignition point is created. Pay attention to all foliage in gardens and beds throughout the seasons. In addition to the pruning suggested above, prune any tree limbs that overhang or touch structures. Maintain a base of rock, plants or nonflammable materials around the base of tree trunks. Water your lawn and irrigate plants on a regular basis when rain is sparse. This decreases the amount of dead foliage on plants. Watering also keeps leaves lush and more succulent than those on thirsty plants. Create several fire-safe zones around your property. Taking adequate site drainage into account, use paving, concrete, bricks and stone walls to develop barriers and areas where fire cannot spread. These fire-safe zones help keep wildfires from spreading across your property. They also provide a short-term place for people and pets to escape if a wildfire strikes without warning. Ponds, creeks and small lakes can provide fire break protection in some cases. Gravel or dirt roads that don’t have overhanging trees are another type of fire-safe zone. Driveways, sidewalks, patios and poolside areas are also fire-safe areas of your property. Any plant will burn when the surrounding heat is high enough. However, embers and light flames are less likely to catch moderately fire-resistant plants on fire. Hardwood trees tend to be less flammable than junipers and pines. For shrubbery and trees, choose from many varieties with moderate flame resistance. Snowberry, Coralberry — Symphoricarpos spp. At Schulhoff Tree & Lawn Care, Inc., we have a number of plants and trees to recommend for your specific altitude and micro-climate. We can also help you create fire-safe zones and keep your plants and trees healthy.